This Christmas, avoid overeating & undoing your hard work thanks to our top tips for handling the festive season. Christmas overeating; a mental and universal dread to dieters and maintainers alike! 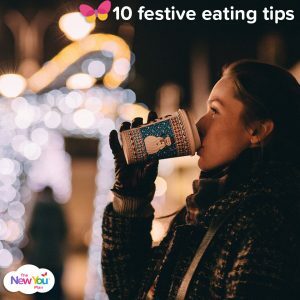 Overeating during the festive time has almost become a way of life, but if you’ve lost weight this year, you are probably keen to avoid self sabotage and beginning a downward spiral from which there is no return. We know from experience that realistically we cannot get through these festive times by willpower alone. We are only too aware of the minefield of parties, scrumptious platters of delicious delicacies and of course family meals and get togethers. Somehow we have a navigate our way through this immense challenge with motivational strategies. 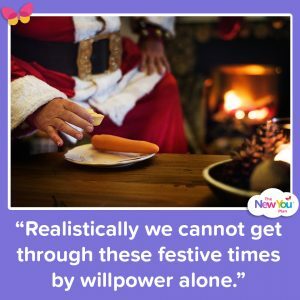 Here at The New You Plan, we love Christmas but without sounding bah humbug, we must question why it is socially acceptable to overeat at this time! We can still celebrate the festive period with our friends and family without it being centered around large amounts of food and treats. How incredible would 2019 be if we started it off without the Christmas bloat or bulge? We have all heard the phrases ‘once you start, you can’t stop’ or ‘just one won’t hurt’. Try to acknowledge that you cannot have just one. Once you start doing something, it often takes more self-control to stop than it does to just avoid doing it in the first place. As it gets harder to stop the longer the behaviour goes on, it’s probably easier to abstain in the first place. But fear not! We are not trying to stop you from eating, but rather helping you avoid getting into the self-sabotage downward spiral that will put you back at square one! 1. We often confuse hunger for thirst, so keep your body hydrated. Drink plenty of water throughout the day, particularly before and during meals. 2. Make sure you get adequate sleep! Science shows that lack of sleep can skew our appetite and lead to poor decision making when it comes to food. 3. Bring your own treats to an event. By having your own healthy options, you won’t be tempted to stray too far from the day’s intentions. 4. Skipping breakfast and lunch so you can enjoy a big dinner is an exceedingly bad idea. Not only will skipping them slow down your metabolism but it will also drain your will power just when you need it the most. 5. Keep your portions small. 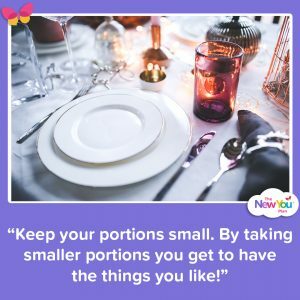 By taking smaller portions you get to have the things you like which in turn, makes you feel less deprived. 6. Eat slowly! It takes around 20 minutes for food to reach our stomachs! If you are in the middle of a conversation put your knife and fork down to allow yourself time for your food to digest! So what if everyone has cleared their plates and are now loosening their belt in discomfort. Take your time and enjoy the taste of your food! 7. “Who is ready for seconds?” Don’t let pushy relatives catch you off guard. Cover your plate with your hands and say no thank you! 8. If you are having alcohol, don’t go mad. Empty calories are not the calories you need or require. Try adding soda water to your alcoholic drinks instead of calorie laden full fat alternatives. 9. Get moving! Suggest a walk or a game of twister; something to get you moving and burning those calories. 10. Time to reflect! Do you feel lethargic? Does your tummy resemble the stuffed turkey? Are you feeling anxious or do you feel satisfied, energetic and happy? Your body will let you know whether or not you made the right choices. One mindful thing everyone can try when they want to turn down Christmas treats, is to think NO and make a fist with your hand. Making a fist is the action you make when you are refusing something. 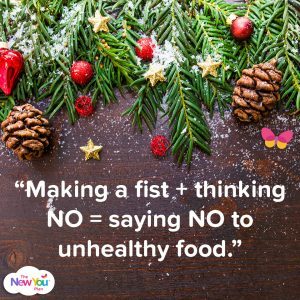 Making a fist + thinking NO = saying NO to unhealthy food. So there you have it! If you have the right plan you can manage those naughty little temptations without damaging all your hard work! “I really regret eating healthily today”… said nobody, ever! ← Eilis’ Unbelievable 2018 New You Plan Transformation Revealed!